For several days, the U.S. Weather Bureau had been tracking a large, complex storm system moving toward the middle of the country from the Pacific Northwest. Strong thunderstorms erupted across parts of the Ozarks on Saturday afternoon and evening, eventually producing several tornadoes in Missouri and Arkansas. The most intense tornado struck Conway, AR as a slender but violent F4, tearing a narrow, block-long path through a residential area and killing six people. A photo of the Conway, AR tornado, taken by Bill Albright after the tornado had leveled part of the town. Severe damage in a residential area of Conway. Aerial view of the intense destruction in Conway. When weather offices throughout the Southwest and Central Plains released their morning weather balloons on Sunday, the rawinsonde data that they received was disconcerting. Winds near the 500mb level, about 18,000ft., were extremely strong. Stations across a broad swath of the Midwest reported winds well in excess of 100kts. An absolute maximum of 159kts — 183mph — was detected over Dodge City, Kansas. By the time all observations had been taken, analyzed and prepared into charts, the larger picture had fully come into view. An exceptionally strong jet stream was digging into the heart of the Midwest, and rounding its base was an extraordinarily intense jet streak with a core of 135kt winds. 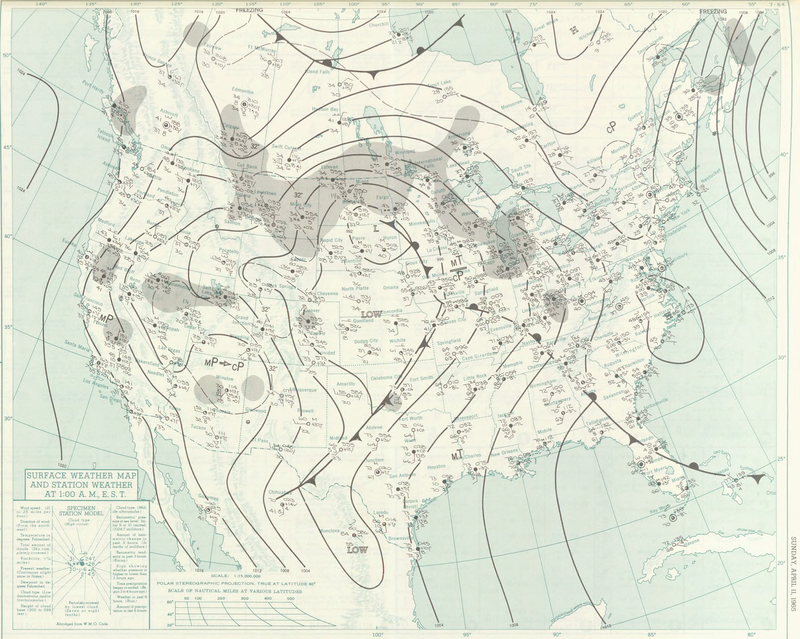 A chart showing wind speeds at the 500MB level on April 11, 1965. Note the intense jet streak located over the Midwest, with an absolute maximum of 140kts over west-central Illinois. Hand-analyzed surface map for 12am on April 11. The low pressure system, rapidly deepening in response to the exceptional upper-level winds, drifted eastward toward central Iowa. Hand-analysis charts revealed a warm front surging northward through central Illinois, Indiana and Ohio, eventually pushing into southern portions of Michigan. Trailing behind the low, a cold front was draped south across the Ozarks and southwestward to Texas. By 10:45am CST, forecasters at the Severe Local Storms Center, a forerunner of today’s Storm Prediction Center, began to suspect that conditions were setting up for rough weather. The intense jet streak, along with very intense, veering winds throughout the atmosphere, provided abundant rotational energy for any storms that managed to fire. Shortly before noon, a Severe Weather Forecast was issued mentioning the possibility of isolated tornadoes from northeast Missouri to central Illinois and north-central Indiana. Severe Weather Forecast Number 68, issued at 1pm CST by the Severe Local Storms Center. The area of concern is outlined by a polygon. A FEW SEVERE THUNDERSTORMS WITH LARGE HAIL DAMAGING WINDS AND ONE OR TWO TORNADOES ARE EXPECTED FROM 1 PM UNTIL 6 PM CST THIS SUNDAY AFTERNOON AND EVENING IN AN AREA BOUNDED BY THE POINTS 40 MILES SOUTH OF BURLINGTON IOWA TO 50 MILES WST OF LONE ROCK WISCONSIN TO MILWAUKEE WISCONSIN TO 40 MILES SOUTH EAST OF CHICAGO ILLINOIS BACK TO THE POINT 40 MILES SOUTH OF BURLINGTON IOWA. A woman stands amid the ruins of her home in Watertown, WI. The demolished farm of Edwin Shroeder. A number of cows were killed and buried beneath the hay when the barn was destroyed. Radar operators at the US Weather Bureau office in Chicago — one of just two offices in the affected area with access to the somewhat more modern WSR-57 radars — monitored their screens with nervous anticipation as several small, white blotches began to grow in size and number. Explosive thunderstorm development had begun across Iowa, Wisconsin and northwestern Illinois. 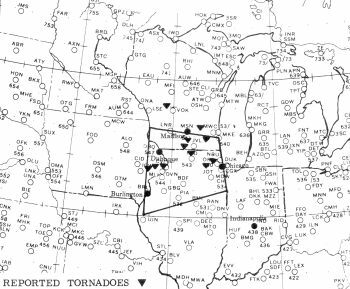 Unknown to the operators at the time, multiple tornadoes were already in progress and causing extensive damage through largely rural areas of Iowa and Wisconsin. A large cone tornado touched down near Stockton, IL and moved rapidly to the northeast, cutting a swath of destruction through the northwest side of Monroe, WI. More than 100 structures were damaged or destroyed, including over a dozen trailers in a trailer court. Forty people were injured, many of them in mobile homes and vehicles. Trailers and barns were shredded by another tornado east of Evansville. Three people were killed (A) when a truck was thrown into a basement, and one woman (B) was killed while hanging laundry. Three occupants were killed when this truck was thrown onto the table under which they had taken shelter. Sheriff Roberts scrambled for his radio as the violent tempest began tearing across the south side of Crystal Lake, ravaging dozens of homes in a number of subdivisions and devastating the Lake Plaza Shopping Center, lofting large chunks of debris high into the air. In Colby Holmes subdivision, three people were killed when a truck was thrown into the basement in which they were taking shelter under a heavy table. Just yards away, another woman was killed as she was unwittingly removing laundry from her clothesline. Her home was one of 45 that were completely swept away in high-end F4 fashion. The tornado continued on for another ten minutes, cresting a small hill before barreling into the small community of Island Lake. More than 150 homes were destroyed in all, and six people lay dead. An aerial view of the damage in Crystal Lake. One of many homes destroyed in Crystal Lake. Extensive damage was caused to the Crystal Lake Shopping Center. An aerial view of the damage at Island Lake. The road at left is Rt. 176 near Lakeview Drive. The outbreak, however, had scarcely begun. High in the atmosphere above the Wisconsin/Illinois border, the jet stream had split into a northern and southern branch. In the area surrounding the split, the already powerful atmospheric dynamics had become even more dangerous, providing additional lift to areas already undergoing explosive thunderstorm development. Supercells dotted the screens of the Weather Bureau’s spotty network of aging WSR-1 and WSR-3 radars, many sporting the textbook hook echoes indicative of intense tornadic rotation. In northwestern Indiana, the mid-day sky had turned an odd, vaguely ochre hue. While concerning to some who had heard news of the incoming bad weather, most continued about their day without a second thought. Unknown to observers at the time, the strange color had been produced by fine particles of topsoil, scoured from the Earth by the tornadoes to the west and carried aloft by the swift winds of the jet stream. Finally beginning to realize the extent of the developing tornado threat, the Chicago weather office issued a “Tornado Forecast” at 4:35pm CST for an area 60 miles either side of a line from Detroit, Michigan to Lafayette, Indiana. Along with the tornado forecast came the warning that strong storms had begun developing over northwestern Indiana. Despite the limited technology and paucity of available information at the time, this tornado forecast would prove to be exceedingly prescient — nearly every significant tornado during the remainder of the outbreak would occur within the bounds of this forecast area. Officials and Weather Bureau personnel in the South Bend area sprang into action to prepare for the arrival of the storms. Additional personnel were called into the Weather Bureau office to assist in tracking the storms and issuing warnings. Emergency managers began preparations for the damage that was sure to follow. Indiana State Police, who had recently taken a cue from their brethren in the Great Plains and held three-hour “Severe Weather Surveillance” training programs, scrambled into position to track the incoming storms. They would not have to wait long. Just ten minutes after the tornado forecast was issued, at 5:32pm EST, another call from the Chicago office indicated that a rapidly intensifying thunderstorm had been spotted in northwestern Indiana. Less than 15 minutes later, the first of a violent wave of tornadoes touched down in Starke County, southwest of Hamlet, Indiana. The La Paz tornado shortly after touching down north of Knox. William Gebard and his two daughters pick through the rubble of their summer home at Koontz Lake. Aerial view of the destruction at Walkerton. After crossing US Route 30 on a northeast heading, the slender funnel traversed nearby Koontz Lake as a violently rotating waterspout. Upon reaching the shore of the lake, the savage winds ripped through a cluster of cottages. At least a hundred cottages were damaged or destroyed and one man was thrown more than 600 feet to his death by the winds. As the tornado crossed US-31, Indiana State Trooper Robert Chandler took one of the most famous photographs from the outbreak. Taken from just a few hundred yards away, the funnel appears a brilliant white due to the reflection of the bright sun against the dark, stormy background. Continuing northeast at speeds in excess of 60mph, the funnel appeared wide and gray as it barreled into the northern edge of the community of La Paz. Six homes were leveled and a church was destroyed in the small town as the tornado began to grow slightly. The La Paz tornado minutes before Robert Chandler’s famous photograph. Robert Chandler’s famous photo of the small but violent La Paz tornado as it crossed US-31 northeast of La Paz. The La Paz tornado loomed menacingly as it bore down on the small town of Wyatt. The National Guard works quickly to assist victims and clean up damage along Main Street in Wyatt. A homeowner looks into the basement of their home in Wyatt, which was swept away. Aerial view of the destruction in Wyatt. At Lakeville, a local high school still under construction — the jewel of the community because of its beautiful new gymnasium and basketball court, a point of pride in basketball-crazed Indiana — was flattened to the ground. The tornado then engulfed the small town of Wyatt, damaging or destroying more than three-quarters of the structures in town. A large grain elevator was destroyed and several cars were thrown hundreds of yards from Bremen Rd. Fortunately, most residents had received advance warning of the tornado via television and radio – a luxury that would be all too rare in the following hours. The F4 tornado finally dissipated northeast of Wyatt, ultimately killing ten and injuring more than 80 along its 36-mile path. Around the same time, a slender but powerful tornado struck the community of Wanatah, in Laporte County, IN. The tornado caused significant damage to several farmsteads and was well-photographed as it exited the Wanatah area. A view of the Wanatah tornado looking southeast from County Rd. 1250. Just northeast of the La Paz tornado, a monster descended from the clouds southwest of Wakarusa in Elkhart County, IN. Leaving a narrow trail at first, the powerful funnel tore into Wakarusa and destroyed a number of homes, killing one small child. Soon after, the tornado would become a part of history. After snapping and uprooting trees in the countryside, the tornado approached U.S. Highway 33 between Dunlap and Goshen as a rapidly expanding, half-mile wide wedge. Paul Huffman, a reporter for the local Elkhart Truth newspaper, was on his way home from church with his wife Elizabeth when they noticed what appeared to be smoke billowing into the air. Pulling off the side of the highway to take a closer look, they noticed that the “smoke” was, instead, a massive tornado. 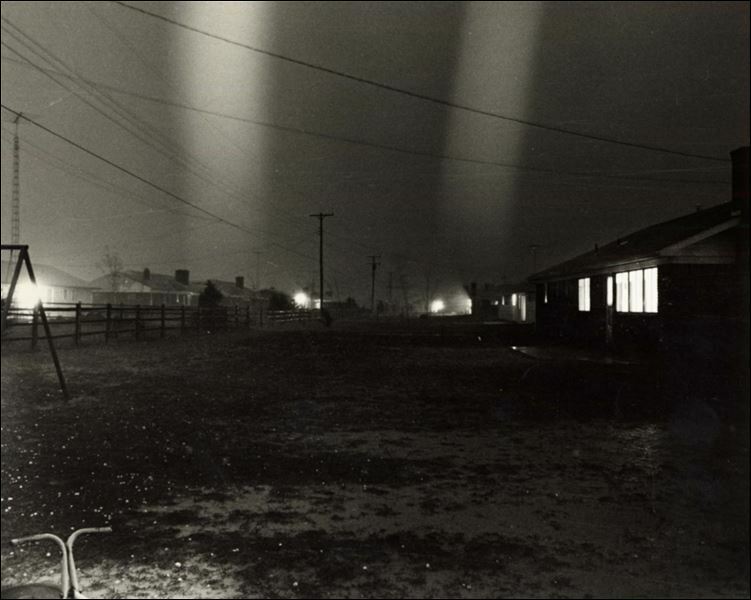 Grabbing his camera, Mr. Huffman snapped a series of six photographs as the tornado approached his location. The fourth photo, sometimes known as “The Twins” would go on to become one of the most iconic weather photographs ever taken. The violently rotating multivortex tornado slammed into Midway Trailer Court just after 5:15pm EST. Two massive vortices swirled around a common center, obliterating trailers and throwing debris into the air. As Mr. Huffman braced himself against the strong inflow winds, a car — still airborne after being thrown by the tornado — crashed to the ground nearby. It would later be determined that the automobile was airborne for at least a full three-quarters of a mile. Eighty of the 100 trailers at Midway were destroyed and ten people were killed. An airplane wing from Goshen Airport, where planes were tossed and ripped apart, was eventually found more than 35 miles away in Centerville, Michigan. The tornado continued on, demolishing much of the Jefferson Place subdivision and killing several people. Finally, the tornado struck Middlebury, sweeping away several homes and claiming another three victims. The tornado killed 14 in all, causing borderline-F5 damage at several points along its 22-mile path. Aerial view of Midway Trailer Court. Crews work to remove the rubble from the Midway Trailer Court. A number of homes were completely obliterated in the new Jefferson Place Subdivision, just northeast of Midway. Aerial view of the destruction at the Jefferson Place Subdivision. Survivors pick through the wreckage of homes in the Jefferson Place Subdivision. Several homes leveled and swept away in Middlebury, IN near the end of the tornado’s path. Aerial view of the destruction at Middlebury. A Mrs. Ed Nihart was killed in a car thrown from CR-10 (upper arrow), and a Mrs. Lester Miller was killed when her home was demolished (lower arrow). Four people were killed near the intersection of US 20 and SR 15. The Midway Truck Stop is located at top center. At approximately 5:40pm CST, just as the F4 that chewed through the Midway Trailer Court dissipated, a second violent multivortex tornado formed just south of the first. Beginning as an ephemeral, wispy waterspout over a small lake south of Goshen, the tornado intensified quickly as it crossed State Road 13 and destroyed a number of farms. The tornado thundered toward the Rainbow Lake area, completely demolishing a dozen homes and sweeping them away. Seventeen were killed in the area, where damage was so intense that an F5 rating may have been warranted. Onlookers described the tornado as initially having the appearance of serpents writhing around a central point, eventually evolving and expanding into a massive, malevolent wedge with “octopus-like appendages” reaching out horizontally. The tornado continued on for another 20 miles, killing two while they sheltered in their home in Ontario. By the time the tornado ground to the end of its path around 6:00pm CST, the outbreak had reached a ferocious peak. Aerial view of the damage on the western shore of Lake Pleasant, IN. In the northeast corner of Indiana, one of the most devastating events of the outbreak began to unfold. A slender gray funnel began causing damage about two miles west-southwest of Lake Pleasant. As it approached the lake, the tornado widened and rapidly intensified. Damage along the eastern shore of the lake was extreme, with several structures reduced to rubble piles. Trees in the area were almost completely debarked and denuded, with many snapped and twisted close to ground level. As the tornado crossed the Michigan border, first warning came from a deputy sheriff in southern Branch County. Witnessing the approach of the tornado, he scrambled to his car to radio in an alert. Moments later, the car was tossed off the road and rolled several times, causing serious injuries to the deputy. Roaring across the landscape, the twister leveled much of the town of East Gilead before bearing down on Coldwater Lake, leaving a damage path more than a mile wide. On the lake’s western shore, a number of cottages along Pearl Beach “exploded” and were swept from their foundations. Much of the debris was thrown into the lake, and more than a dozen vehicles were thrown from surrounding roads. Trees were mangled and stripped of their bark, and the grass was “torn out by the roots” in some areas. In the center of Coldwater Lake, the small peninsula of Iopawa Island was also devastated. Every home on the island was leveled, some of them swept away and dumped into the lake. A row of cottages was leveled near Pearl Beach on the western shore of Coldwater Lake. A car thrown from the road on the west side of Coldwater Lake. Residents pick through the rubble of their cottages near Pearl Beach. Every home on Iyopawa Island, located in the center of Coldwater Lake, was destroyed. A number of homes were swept cleanly away on the western shore of Coldwater Lake. Trees lining the shore near Crystal Beach were reduced to stubs. The giant twister slammed into the eastern shore of the lake with a fury, demolishing the large Davis Marine marina, throwing several boats from the water and killing the owner, Hank Davis. Homes along Crystal Beach were damaged or destroyed, and cars and tractors were thrown hundreds of yards. One news report, likely apocryphal, claimed that some vehicles driving along Lake Drive were snatched up by the tornado and thrown three to four miles across the countryside. Speeding to the northeast at 60mph, the tornado tore through dozens of farmsteads south of the hamlet of Quincy. The Busy Bee Farm, one of the most prominent dairy farms in lower Michigan, was completely obliterated and scattered for hundreds of yards. Near one demolished home, a large, heavy steel tank was torn away from its anchoring and thrown more than half a mile. A tractor thrown hundreds of yards on the east side of Coldwater Lake. Severe damage along the eastern shore of Coldwater Lake. A home demolished east of Coldwater Lake. A number of homes and barns were obliterated on the east side of the lake. The following day, the eastern shore of the lake was choked with debris. A before and after view of the Busy Bee Farm, located south of Quincy. In the background, a large steel tank was thrown more than half a mile. More than 300 head of livestock were killed in the Hillsdale area, some of them thrown great distances and badly mangled. An 80-year-old woman was blown 300 yards into Baw Beese Lake but survived by clinging to the debris of her home. Further northeast, the tornado devastated the community of Manitou Beach, sweeping away a number of homes and throwing them into nearby Devil’s Lake and Round Lake. Six members of one family were killed in this area when the tornado obliterated their home. The local Baptist Church, where 50 people were attending evening services, was struck and destroyed. More than half of those inside were injured and trapped under the rubble for several hours, and three people died from their injuries. The church spire was thrown into the lake, where it was embedded nine feet into the lake bottom. Survivors search the debris of homes at Manitou Beach. Aerial view of the damage near Manitou Beach. The twister continued its northeasterly course, causing severe damage near Onstead and Milan. On the northern edge of Tecumseh, the funnel skirted a tower at Mayers Airport. Despite being several miles from the core of the tornado, an anemometer affixed to the tower recorded an extraordinary wind gust of 151 miles per hour. According to Dr. Theorode Fujita, who used this valuable data to estimate the wind velocity, direction and structure inside and around the tornado, the core flow of the tornado itself likely had wind speeds ranging from 180 to 240 miles per hour at the time the measurement was taken. Wind trace from the anemometer near Tecumseh, Michigan. Peaks of 151 and 75 miles per hour can be seen with the passage of each tornado. This graph is read from right to left. Approximately 35 minutes after the first tornado had touched down, a second tornado crashed to the earth and began to follow nearly the exact same path. The paths of the two tornadoes were so similar that, in most instances, it was impossible to tell the two apart. The second tornado swept through many of the same areas, flattening and sweeping away virtually anything that had been spared by the first tornado. Residents who had ventured outside to assess the damage were caught off-guard, as were volunteers who’d come to assist the many casualties. Drivers fled from their cars and dove into ditches along US-27. According to one witness, “bodies were dropping everywhere in fields.” Several people were thrown more than a quarter of a mile, and cars were tossed hundreds of yards. Some bodies were thrown into swamps dotting the area. By the time the second tornado was through, the two twisters had wrought a path of catastrophic damage ranging in width from one to more than three miles. At least 19 were killed in Branch County alone. A further 11 were killed in Hillsdale County. The two tornadoes ultimately claimed at least 44 lives along paths totaling 90 and 75 miles, respectively. More than 600 homes and dozens of businesses and other structures were destroyed along the damage path, many of them swept cleanly away. The second tornado also passed near the Mayers Airport, registering 75mph on the anemometer despite being even further away. Both tornadoes were later rated F4, though the first was likely the stronger of the two. In Indiana, the outbreak continued with undiminished ferocity. A funnel cloud dipped to the earth southwest of Lafayette, quickly growing into a violent stovepipe tornado. It cut a path nearly 22 miles long through central Indiana, causing extreme damage in and around the towns of Mulberry, Cambria and Moran. Despite leveling dozens of homes and sweeping several away, this massive tornado was one of few that did not cause any fatalities. Television and radio helped to warn some people in the path, and the tornado remained highly visible through much of its path. The second of Donald Cox’s photos showing the evolution of a large horizontal vortex wrapping around the massive tornado. Another photo of the Cambria tornado as it approached Moran. One of two photos of the Cambria tornado, taken by Donald Cox. The photo is facing south from the Rossville area. A large horizontal vortex can be seen developing on the left side of the funnel. About eight miles south of South Bend, yet another violent tornado began tearing up soil and vegetation. Traveling just north of the track left by the multivortex funnel that demolished the Midway Trailer Court, the tornado roared into the town of Dunlap, causing catastrophic damage to the subdivisions of Sunnyside and Kingston Heights. Many homes were swept cleanly from their foundations, the debris scattered and granulated by the winds. Vehicles were thrown and mangled, and in some areas grass was scoured from the ground. Twenty-six people were killed at Sunnyside alone, along with two at Kingston Heights. A further six lives were lost as the tornado leveled a truck stop and a well-built home at the intersection of Highways 15 and 20. This tornado would prove to be the deadliest of the outbreak, taking 36 lives in all. Originally rated F5, the twister was later downgraded to F4. By 6:25pm, between seven and nine violent tornadoes were simultaneously scouring the earth across Indiana and Michigan. A mile-wide tornado that began in Crawfordsville, IN obliterated more than 50 homes in and around Lebanon, killing six members of one family and another five nearby. The Lebanon Shopping Center was completely wrecked. Another four people were killed when the tornado ripped two vehicles off the road and threw each of them more than 100 yards. Ten more were killed in Sheridan, where the tornado demolished numerous homes, granulated debris and stripped trees bare. The Lebanon Shopping Center was badly wrecked. Lawrence and Elwilda Kercheval were killed here when their home was leveled near Sheridan. The tornado was so intense near Sheridan, IN that it swept a number of homes away, granluating much of the debris into small chips and shards. One of the most damaging tornadoes of the outbreak began just west of the small community of Russiaville. As the tornado churned through the center of town, more than 90% of the buildings were damaged or destroyed. So complete was the destruction that one National Guardsman would later describe the scene at Russiaville as “like a city that has been bombed and burned.” The funnel widened to nearly one mile as it engulfed the town of Alto. At least 100 homes were leveled as the tornado rampaged through Alto and into the south side of Kokomo. The well-built brick buildings of Maple Crest Apartments were damaged to varying degrees, with at least one leveled to its basement. Photo of the Russiaville tornado taken by Beauford Krall. Intense damage in Alto, Indiana. A home along Wigger Street in Marion, Indiana reduced to its foundation by the Alto tornado. More than 90% of downtown Russiaville was destroyed, with several buildings leveled to the ground. A photograph of the Alto tornado as it approached the south of Kokomo. The Russiaville tornado reached its peak intensity near the community of Greentown. The tornado tore at the soil and left cycloidal scour marks across the fields to the west of town. These marks would come to serve an important role in the research of Dr. Fujita, who would later explain the source of their origin as narrow, particularly intense suction vortices within the main circulation of the tornado. The tornado maintained its intensity while tearing through Greentown, where 80 buildings were razed and ten people were killed. The tornado struck with such violence that it scoured the grass from the backyards of many homes and completely debarked and denuded many trees in the area. 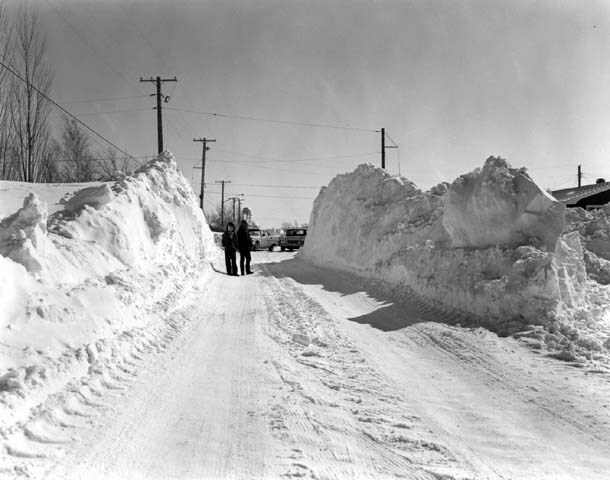 A number of fatalities occurred in cars which were lifted and tossed several hundred yards by the furious winds. Moving into the town of Marion, the tornado demolished dozens more homes and wiped out a small trailer court. A hospital and a shopping center were heavily damaged, and vehicles were again thrown from the road. In all, the tornado killed 25 people and injured at least 800 others across a 48-mile path of devastation. Probable F5 damage in Greentown. 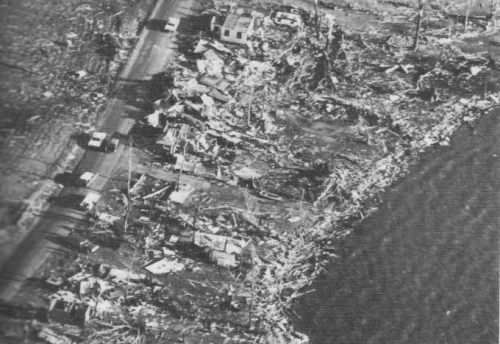 Several homes have been leveled and intense wind rowing is evident. Deep cycloidal scour marks east of Greentown, left by an intense suction vortex which swept away a home at top center. Aerial view of the tornado’s path through a suburb of Marion. A severely damaged shopping center in Marion. A field strewn with rubble east of Marion. A field strewn with rubble west of Marion. Numerous trailers were torn apart in a small trailer court in Marion. Aerial view of the destroyed trailer court. Shortly afterward, another violent tornado began a path of destruction in northwest Toledo. For 33 year old Paul Smith, a foreman for the Norfolk & Western railroad, the approaching twister was preceded by spasmodic rain and pounding hail. Before leaving his home in the recently-built neighborhood of Fuller’s Creek Addition, he hesitated a moment and turned back to reassure his fearful wife and children. Moments later, a nearby window shattered and sprayed shards of glass through the room. Wind and rain lashed the siding and roof. The tornado thundered through Fuller’s Creek with tremendous force, tearing many homes from their foundations and scattering the debris hundreds of yards away. Paul was thrown in the air, as if being “swept away in a vacuum.” When he came to his senses, he found himself face-down in what remained of his neighbor’s garage with multiple cuts and bruises. His wife was found dead several blocks from the site of their home. Dozens of homes in the Fuller’s Creekside subdivision of Toledo were completely obliterated. Extreme damage to the east of the Toledo-Detroit Expressway (upper left). The bus which was thrown from the Toledo Expressway, killing five occupants. Intense damage along Edgewater Dr. in Toledo. Webber’s Waterfront Restaurant, just across the Michigan border on the Lost Peninsula, was destroyed. This photo, taken by Jim Weyer, allegedly shows the Toledo tornado illuminated by an unexplained electrical phenomenon. The damage path continued with nearly undiminished violence for 18 miles before moving on to Lake Erie, but the most intense damage was found in Fuller’s Creek. A large DuPont paint factory was demolished, as were at least two other industrial buildings. More than 50 homes, some well-built, were swept cleanly from their foundations with possible F5 intensity. A bus was ripped from Interstate 75 and lofted through the air before being crushed upon landing, killing five occupants. The Toledo tornado took a total of 18 lives, 16 in Ohio and five at Fuller’s Creek Additions. Nearly 250 more were injured. A photograph taken during the storm allegedly shows the tornado as two broadly spaced, glowing cylinders. While some have speculated that the photo shows the tornado glowing as a result of some static electrical phenomenon, the picture remains open to interpretation. Just over an hour later, the last violent tornado of the outbreak began to fill the skies over Pittsfield, OH with bits of timber, furniture and vegetation. Virtually the entire town was destroyed, and six homes were damaged so badly that they reportedly “vanished into thin air.” Those who emerged from the wreckage remarked that nothing in the town was left standing, with the exception of a Civil War memorial statue. Seven of the town’s 50 residents were killed, as were two motorists who were caught in the storm while passing through town. Twenty miles later, the town of Strongsville also bore the full fury of the tornado’s winds. Fifty homes were irreparably damaged and as many as 20 were leveled completely. Witnesses again testified that several homes “literally vanished.” A total of 18 were killed between the two communities. This tornado was rated F5 and later downgraded to F4, though the initial rating was likely correct. Although there have been larger outbreaks in terms of raw numbers, the Palm Sunday Outbreak of 1965 still stands as one of the most intense in history. In the span of just 11 hours, 47 tornadoes killed 271 people. Twenty-one of those tornadoes took at least one life, and 38 were rated F2 or higher. Nineteen F4 tornadoes raked five states in the span of nine hours. Of those, as many as five produced damage that may have warranted an F5 rating. When normalized to adjust for inflation and other changes, the Palm Sunday Outbreak still ranks as the most destructive single tornado day ever recorded. The outbreak also stands out for another, equally tragic reason. The extremely high death toll is owed in part to the twin failures of personnel and equipment. At the U.S. Weather Bureau office in Lansing, Michigan, a burnt circuit left the teletype machine out of commission. At the height of the event, warnings and bulletins from Fort Wayne and South Bend fell on deaf ears as the Lansing office was unable to receive them. In Muskegon, the WSR-3 radar was rendered useless by a failing vacuum tube. With no radar coverage, both Muskegon and Grand Rapids were left to rely on spotty communication that, in many cases, did not come until far too late. In Grand Rapids, further problems came in the form of human error. The staff was caught completely off-guard by the developing outbreak and was unable to issue timely warnings. Further issues arose because officials in Michigan lacked a single agreed-upon radio frequency on which to communicate. Communication between fire, police, emergency management and other officials within a county became extremely difficult, and contact with personnel out of county or out of state was virtually nonexistent. Additionally, when Weather Bureau offices did manage to identify and comprehend the threat, they failed to pass the information along to offices downstream. The days and weeks that followed brought finger-pointing from all parties, but eventually led to a number of changes to facilitate faster, easier communication during future events. Yep, I posted some of the research I’m working on for new posts and others posted some great stuff as well. There’s a surprising amount of information available for several historical outbreaks, actually, just takes a bit to track it down. Thanks for visiting John! Those two tornadoes that affected Manitou Beach in Michigan is something that I honestly have never read of before…I have heard of multiple tornadoes in a row striking communities with closely parallel paths (Tanner and Cordova, Alabama, for instance) but not a virtually identical one. If it wasn’t for that anemometer, I doubt there would have been any way for us to know which of the two was stronger (not that the difference was that much). And they say lightning never strikes twice! P.S. I also find it an interesting coincidence that four major outbreaks in this country have all occurred on Palm Sunday. Man, the weather must not take kindly to religious people. Well the anemometer reading wouldn’t be much evidence as to which is stronger – the first could have been weaker (hypothetically) but have passed directly over the site, whereas the second could have been an F5 at a distance. I’ve always been surprised this outbreak continues to have no official F5’s, particularly considering the frequency of questionable F5’s in the 70’s. I never knew there were three fatalities in the basement in Crystal Lake. That photo always stood out to me in Significant Tornadoes – incredible destruction. lol.. Palm Sunday has definitely had its share of tornadoes. I suppose that’s what happens when you have a holiday that falls anywhere between late March and late April. I plan to do a post on the ’94 event sometime. The Ohatchee/Piedmont tornado was pretty impressive, and of course tragic considering the United Methodist Church in Goshen. And I agree extreme, I don’t know how the several potentially F5-worthy tornadoes weren’t rated as such when we have so many other F5s that almost certainly shouldn’t have been. I sure wouldn’t want to have to use the historical record for any sort of risk-assessment. The “double funnel” photo of the Goshen tornado is very similar to the tornado that occured at Tushka, Oklahoma. The Tri-State is also reputed to have been a “double funnel” at certain points in its life. I wonder if that’s something else entirely, because when I think of subvortices, I think of narrow, cylindrical funnels rotating around a common core within a large vortex, not too wedges. Man, amazing how complex the atmosphere is, and how we understand it less then we seem to understand flying into space! Yeah, there have been a few tornadoes that have exhibited a similar “double funnel” structure, at least briefly. Other examples slip my mind at the moment. It’s actually the same phenomenon as multiple vortices, though. It depends on something called “swirl ratio.” It’s a little complicated, but it’s basically a measure of the ratio between the tangential velocity of the flow near the bottom of the tornado and the strength of the updraft within. As that ratio increases, the updraft is no longer able to lift that flow near the bottom (increased velocity = increased mass) and it breaks down into multiple vortices. The number of vortices is influenced by the swirl ratio, and if the ratio’s just right you can end up with just two large, Goshen-esque vortices. It’s really neat stuff. You are an extremely gifted writer. What got you fascinated by tornadoes? This is the best blog I’ve ever seen dedicated to such enigmatic phenomena. Thanks Ricky! I used to be scared of tornadoes as a kid (which is totally unwarranted since I lived in Pennsylvania), and eventually I decided the best way to overcome my fear was to learn more about them. I don’t know why, but I just got hooked. Been fascinated with severe weather and tornadoes ever since. If you have any particular events you’d like to see covered, feel free to make a request. This post I’m working on now is taking forever, but it ought to be done shortly. Do you believe that tornadoes have the ability to exceed 318mph winds? Could it actually be possible for a tornado to have winds way in excess of that number? I don’t see why not. Velocities of 302 +/- 20 mph were found in the ’99 Bridge Creek – Moore tornado, of course, and there’s nothing to suggest that was anomalously intense as compared to many other F5 or EF5 tornadoes. The problem is we’ve only observed a very, very small fraction of tornadoes, and even when we have observed a tornado it’s often only been for a relatively small portion of its lifetime. Aside from that the only method we have to infer intensity is damage, and that’s a pretty poor way of doing it. 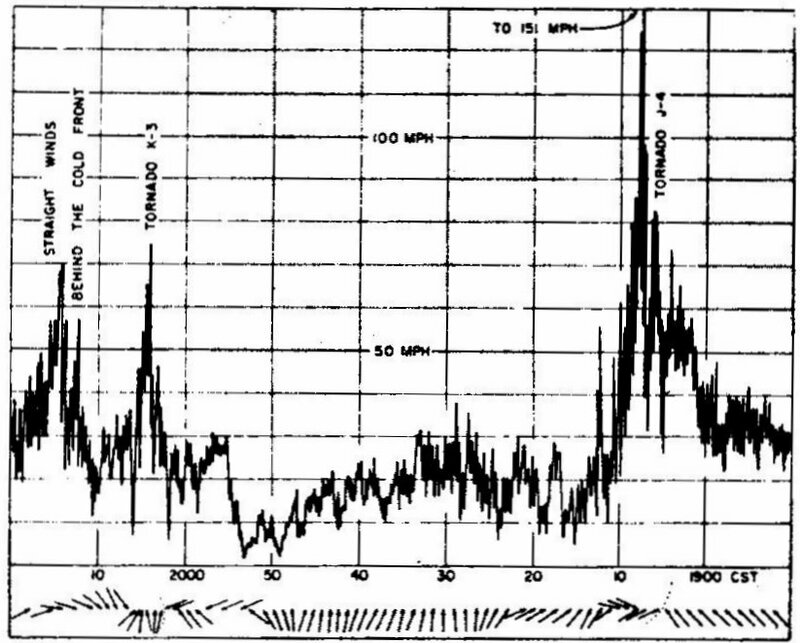 There was actually a paper released in 2002 that speculated there may be very brief wind gusts to transonic velocities (about 600–760 mph) on a small scale in the corner flow region of the tornado. That’s basically where the core of the tornado meets the surface and the surface inflow begins being lifted upward. It’s pretty interesting, but I don’t think we have any way to prove or disprove it at this point. You’re welcome. It’s hard to say, if those winds exist they’re likely very brief and isolated to an extremely small scale, so I don’t think they’d be responsible for much damage. I’m just speculating though, I don’t think anyone really knows. If we had mobile radar data for more of the most violent tornadoes I wouldn’t be surprised to see some of them have max velocities well above 300 mph. I believe I’ve seen papers dealing with the theoretical “speed limit” of tornadoes, I’ll see if I can dig some of them up. What do you think of the Ivanovo tornado outbreak of 1984? I’ve heard some amazing things such as total destruction of steel reinforced concrete buildings and very heavy objects being thrown long distances (construction cranes and water tanks) but how accurate is all that and could such amazing feats actually happen if these were inaccurate reports? They’re amazing reports, but I’m skeptical. If we could find photos or some other sort of reliable documentation that confirmed these things, I think you’d have to consider the Ivanovo tornado one of the most violent on record. But I very much doubt we ever will, so I suppose it’ll remain something of an enigma. Maybe the Enigma Outbreak Pt. II, haha. I do think it may be possible for a tornado to produce some of the damage claimed, though I think it’s quite likely some of it was exaggerated or outright fabricated. Kind of the same way initial tornado reports here in the US sometimes say buildings have been “leveled,” only to find later that it was moderate EF3 damage. Do you have another link for the report that you posted on transonic gusts. Whenever I click it, it doesn’t work. Thank you! Also do you think that we’ll eventually be able to prove such high wind gusts exist in certain tornadoes and do you believe that they actually do? Whoops, sorry. It’s a PDF, so you’ll have to right click the link I posted above and then “save link as.” You should then be able to open it wherever you saved it to, but if you can’t, you’ll need to download something like Adobe Reader. You can also change your settings to open PDFs in your browser by default instead of downloading, but the above method is simpler. As for your other questions, I’m not sure. The math seems to support it, at least theoretically, but it’s way too far over my head to work through it myself. My instinct is that it’s possible since, again, it would only be on extraordinarily small temporal and spatial scales. And given that, I’m not so sure we’d be able to record them directly. Any proof would probably have to come from mathematics and computer simuations. I think it’s more likely that we’ll eventually observe that tornadoes are capable, at least briefly, of wind speeds well in excess of the ~300mph we currently think of as a general “maximum.” This would probably only occur in the most exceptionally violent tornadoes (4/27/11 Smithville/Hackleburg, 5/24/11 El Reno, etc..), but I think there’s a decent chance we may see that eventually. We’ve only ever observed an extremely small sampling of violent tornadoes, and even then only portions of their life cycles and generally 30-50+ meters above the surface, so we really don’t have much data on maxi tornadoes at peak intensity. In addition to both outbreaks having occurred in roughly the same region (the ’65 outbreak was centered about 100-150 miles farther north and the town of Lebanon, IN, was hit in both outbreaks), and both occurring on a Sunday (though the ’65 outbreak peaked much later in the day) the Nov. 17 outbreak also seems to have had a disproportionate number of strong tornadoes — a lot of EF-2s and EF-3s with a scattering of EF-4s. If this outbreak had occurred in mid-April or May under similar wind shear conditions but higher instability, I imagine we would have seen many more violent tornadoes. I suspect that the Washington IL tornado barely missed an EF-5 rating since its peak wind speed was pegged at 190 mph by the NWS, just short of the 200 mph EF-5 threshold. Also, both outbreaks seem to have occurred on the heels of slightly off-season cold snaps and snowfalls. Some areas of central Illinois hardest hit last week had recorded their first measurable snow the previous Tuesday, about 2-3 weeks earlier than average. The main point of the article above is that if you compare the death toll of the 1965 outbreak (270 deaths) to that of the 2013 outbreak (8 deaths), it gives you a general idea of how many lives have been, and continue to be, saved by the advances in weather technology and warning communications in the last 50 years. Yeah, I saw that a couple days ago. I think his point is mostly good – the NWS/SPC, and to a lesser extent local news and the private sector, do a great job and rarely get the credit they deserve – but his premise is misguided at best. The Palm Sunday outbreak was among the most intense on record, with 22 strong (F3+) tornadoes, 17 of which were violent (F4+). Of those 17 violent tornadoes, as many as five arguably could (and in some cases should) have received an F5 rating. Last week’s outbreak was a very significant one, and likely the largest one-day November outbreak in the modern record by many metrics, but it doesn’t compare to the Palm Sunday outbreak in any meaningful way other than the general area affected. The total tornado count (74 at last check) exceeds the official Palm Sunday count (61), but it’s likely that many other weak, short-lived tornadoes went unrecorded in 1965. Both outbreaks have the same number of significant (F2+) tornadoes with 32, but this event currently has just nine strong and two violent tornadoes. That’s still a major outbreak in its own right, especially for the time of year, but it’s not comparable to Palm Sunday. That wouldn’t be particularly relevant if it weren’t for the fact that Mike makes a false equivalence by explicitly comparing these outbreaks and their resulting death tolls to support his point. The warning process has continually improved and we’re undoubtedly better prepared to protect people than ever before, but that was only one factor, and probably not the biggest, in last Sunday’s low casualty numbers. If the Palm Sunday outbreak were to occur again today verbatim, although I don’t think we’d see 271 fatalities, I suspect the death toll would still be very high, possibly into the triple-digits. In some ways, the Palm Sunday outbreak was the Midwest/Ohio Valley’s version of 4/27/11, with multiple large, violent, long-track tornadoes occurring over a relatively small spatial area. We saw how 4/27 turned out. That said, I do think watches, warnings, etc. played a role in keeping people safe. In particular, I think the SPC’s decision to go HIGH Risk right from the 6z outlook was a great decision. And yes, if the instability had been higher/more widespread across the warm sector we could well have been looking at an historic outbreak. There was a small bubble of enhanced instability in north/central Illinois (~2,000 j/kg CAPE), and the Washington EF4 was likely a direct result of that. The amount of helicity across the warm sector was unbelievable; in some areas the 0-1km SRH was peaking at 500-600 m²s²! It’d be unusual enough to see 0-3km that high, but that sort of low-level helicity is downright scary. If you take the same magnitude of shear and helicity as was present across most of Indiana and parts of Illinois and bump the instability up to even 2,000-2,500 j/kg, you’re looking at an atmosphere that’s as impressive as any you’ll see, including April 27, 2011. A 110-120kt jet streak will do that for you. Also, Re: the Washington rating, I initially thought EF5 when the first aerial photos came in. A few dozen homes appeared to be swept cleanly away, and there was intense wind rowing evident (similar in appearance to the Andover tornado, in fact). Looking at ground-level photos of the houses, though, I think high-end EF4 is the right call. Many of the subfloors remained intact, suggesting the walls weren’t well-anchored. They actually looked like they were hardly anchored at all. Nearby grass and low-lying shrubs also appeared undamaged, which indicates EF4 rather than EF5. That’s not to say the tornado didn’t reach EF5 intensity at some point (I think many EF4s likely do), but 190 mph EF4 looks appropriate from what I’ve seen. These write-ups are fantastic and very well done. Nice selections too. Red River Outbreak would be a great candidate. Wichita Falls was the nightmare tornado from my youth that I was always afraid would hit Tuscaloosa when I was growing up there. Sadly, it finally happened. I was just there for the holidays and the damage path is still awful and shocking to see. My grandmother watched the 1932 Northport AL tornado from the backyard as it ripped through downtown Northport just north of her (Tuscaloosa and Northport are separated by the Black Warrior River and essentially the same town). She was terrified for the rest of her life at the first sound of a civil defense siren. Thanks! I do plan to tackle the Red River Outbreak at some point, hopefully soon. I got my hands on some photos of the Wichita Falls tornado that are fairly rare. The Seymour, Vernon and Harrold/Grandfield tornadoes were all very large and likely very intense as well. That must have been a terrifying sight for your grandmother. The 1932 Deep South outbreak is fascinating to me and I planned on covering it after I finished the Enigma Outbreak, but I ran into a few dead ends in my research so I moved on to other events. I’ve been meaning to come back to it. It’s a shame that it doesn’t seem to be as well-documented as some other events of that period. One interesting tidbit I found in a contemporary newspaper was that of a man from Sylacauga, AL, named Luther Kelley. His home was destroyed and his second wife killed by a tornado that day. In 1917, his first wife was also killed by a tornado when their home was destroyed. Talk about bad luck. Also, I have an old hardback copy of THE MIGHTY WHIRLWIND that documents this outbreak. Middle section contains nice reproductions on the entire series of Huffman shots, including after he drove up into the damaged area. Thanks for the heads up, I’ll have to buy a copy of that book. I’ve heard good things about it but I’ve never actually read it. I wish there were some place that archived tornado photos; it often takes me a lot more work to track down photos than it does information, and I think it’s a shame that it’s so difficult to find good photos of important historical events. I was told by my parents on this tragic and devastating day the only good thing to come out of it!!! was me! “Their Tornado Baby” out of all the bad and sad things for others that day!!! They had tears sad and happy!!! tears for others who were lost on this day!! !But tears of joy they were blessed with me!!! I had no idea Toledo was apart of this historic outbreak! By any chance do you know what side of town? I love researching tornados and this by far the best blog I have found. Thank you so much for your thorough work! Hi Amber, thanks for the kind words! The short answer is that it formed on the west side and tore through the north side of town. The longer answer is that the tornado began somewhere near the intersection of Monroe St. & Secor Rd. It then tore a northeasterly path through the north side of the city, passing near the intersection where US-24 becomes Telegraph Rd., and then crossing the Toledo Expressway on the curve just north of the SR-184 exit. There it devastated the Fuller’s Creekside subdivision between Suder Ave. and Summit St. before crossing over the Michigan border into the Lost Peninsula and demolishing several homes along Edgewater Dr. From there it continued on over Maumee Bay and presumably dissipated somewhere over Lake Erie. Incidentally, this all occurred only a few miles south of the violent Temperance, MI tornado, which also continued on over Lake Erie as a massive waterspout. Wow! Thats amazing! Thank you so much for your reply! I’m looking forward to your next post! I was 18 when the tornado hit Fuller Creekside Addition at about 9:35 pm. We lived on Vistamar Drive in home built on a concrete slab. The house was completely destroyed but we all made it through. Several weeks later we received a receipt in the mail with our address on it from a resident’s farm land in Wheatley, Ontario, indicating the path the tornado took across Lake Erie. This is an excellent account of the entire day. My dad and his family used to live in a 2 story house north and east of Cairo on Hook-Waltz Road. Large family. They moved a few years before the Palm Sunday storms. Tornado took the house off at the foundation. House was built of mostly black walnut, had huge corner posts that stuck out into the room. Well built, strong, sturdy. Gone. I remember that outbreak as well. We lived in Dearborn Heights, MI, and really didn’t have much tornado activity. We did see funnel clouds though, and spent most of the day in close proximity of the basement. I remember mostly rather severe t-storms occurring all day. This outbreak occurred a week before my husband was born. What an amazing account of the day! I lived near Lebanon then and was a small child. I remember my uncle going around and gathering up stray horses, tending to their wounds and keeping them in Grandfather’s barn until their owners could be found! What a day–and what incredible photos you’ve assembled! Thanks! You must have been very close to the action then, I’d bet that was quite an experience! Many national changes in severe weather due to this event. The National Severe Storms Forecast Center was created and “watchboxes” were then issued. Amazingly, their was no public teletype weatherwire circuit to relay warnings directly to the media. The forecasters had to phone this info to radio/tv for broadcast dissemination. Also the National Weather Radio system was slowly expanded beyond maritime use to bring weather info to larger population areas. I remember this day well. In Detroit, it was actually a pleasant warmish day (for a change), but around 5:30PM or so the sky was filled with grey, discrete clouds, with dark flat bases all about 10,000(?) feet up moving real fast to the ENE. It looked like a movie picture being played at high speed. At the ground there was virtually no wind at all. Very eerie looking. My dad (who never worried about anything) remarked, as we looked up that sky “I don’t like the looks of this.” It wasn’t until an hour later we found out about the tornado forecast and what was going on. We only got a good garden variety storm with lots of lightning about 9PM; little else. But nevertheless, we were in the basement – just in case. I spent weeks collecting news articles, made maps and even had a card catalog with information on each tornado, its location, etc. If the Chesterfield Township tornado (May 8, 1964) didn’t turn me into a tornado chasing tornado fanatic, this outbreak surely did the job. I began chasing tornadoes in 1968 – within weeks of getting my drivers license. of the comments. I was surprised that the tornados that hit the Allen and Hancock County,Ohio areas were not mentioned. Deaths in this area, including several children and my husband’s grandparents. Hi Teresa, thanks for commenting! Unfortunately, this event was just so big that I had to leave out some tornadoes that really deserved to be covered. I’d have loved to detail every tornado that occurred, but I would have probably ended up taking six months to finish it and writing an article so long no one would read it, haha. In almost any other event, the intensity and tragic human toll of the Lima tornado would have made it singularly notable. It really was a terrible storm, and the parent supercell also produced two of the other strongest tornadoes of the entire outbreak as well. Thanks for this article. I had the misfortune of experiencing this first hand. I was 9 yrs. old, at a birthday party in Wyatt, IN. It was raining and storm was pretty heavy, then it just stopped and the sky turned a weird yellow. As we were looking out the window, we saw the monster pick up a large 2 story farm house and shred it into pieces and then we were told ” get to the basement ! NOW ! As the twister passed over us, it sounded like a train running right over us. It was terrifying. That memory will be burnt in my brain forever. Wow, that’s scary. Thank you for sharing, Eric, glad you were safe! If you remember anything else about that day I’d love to hear about it. I’ve spoken with a few people who had close encounters that day and they all say the same thing as you – they’ll never, ever forget it.